We offer extreme quality Mehndi Cones that are widely demanded in various parts of the world. These mehndi cones are widely acknowledged for soothing fragrance and dark color. In order to meet the wide requirements of our clients, we offer our products at market-leading prices. We offer extreme quality Mehndi Cones that are widely demanded in various parts of the world. This is a renowned product of henna paste. These are available in rolled pack in cone shape with tiny hole at the end. One cone is perfect to decorate simply up to ten hands. These are available in several sizes. 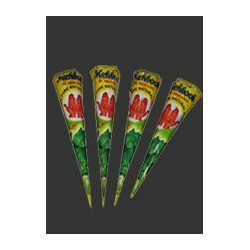 We manufacture this Mehndi Cones with natural and pure herbs as a raw material that is procured from quality driven vendors. These are widely renowned for excellent results and no side effects.